He was born to American parents in Montreal, Quebec and lived both in the U.S. and Canada. He graduated from McGill University in 1897 and went to work for the Canadian Pacific Railway as a civil engineer. He started writing at the turn of the 20th Century and sold his first work in 1902. His writing met with public approval and he moved to New York City and began writing full time a few years later. His initial work was short story railroad fiction. He married in 1910 and he and his bride took a year long tour of the U.S. and Canada both as a honeymoon and as a search for material for his writing. In addition to short story railroad fiction Packard wrote crime fiction and his best known series in this genre is the collection of Jimmy Dale mysteries. Frank L. Packard's book Steampunk Prime was available from LibraryThing Early Reviewers. Frank L. Packard is currently considered a "single author." If one or more works are by a distinct, homonymous authors, go ahead and split the author. 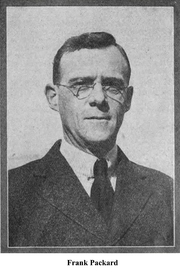 Frank L. Packard is composed of 4 names. You can examine and separate out names.